Today we are exploring the hill towns of Provence along small country roads with beautiful views. Our destination is Roussillon where we have a hotel for the night. Started the day with another great breakfast at our B&B, Mas Guiraud in the farmlands of Beaucaire France. Drove into Beaucaire to buy olive oil and wine for family and for us. Provence produces small amounts of olive oil compared to the other countries. But, as one of the audio guides said, they focus on “quality” hmmm… unlike those Other countries. Beaucaire France is where the Provencal style of bull fighting began (they don’t kill the bull). The bull ring is the center of the largest fair in Europe held for the past 700 years (July). There is also a Chateau and Abbey to explore. Not on our list, but next time. 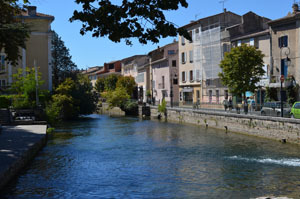 For lunch we stopped at Isle Sur la Sorgue, a lovely village bisected by the river Sorgue and not touristy. The river has lots of beautiful clear water which makes it a refreshing change to this otherwise dry area. We found a park bench by the river for a picnic and watched the locals eat their lunch too. Isle Sur la Sorgue is famous for Antiques. I would have liked to explore the shops but no time. Visited the medieval hill top village of Venasques. Walked the narrow streets and went inside the old church. Peaceful place. One of the French designated “Les Plus Beaux Villages de France” . (There are approximately 157 throughout the country). Visited Gordes. 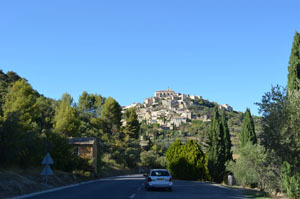 Another beautiful town on a hilltop in the Luberon. In Rick Steves guide he advises admiring Gordes from a distance and wish I’d listened. The town is beautiful yes, but it has become very chic. We had to pay 3 Euros to park, it was filled with tourists, expensive big cars and designer boutiques. Not my style. We walked around a short time and left. Happy to be back on the quiet country road past vineyards and grape pickers towards Roussillon and our hotel. Checked into Hotel Les Sables d'Ocre in Roussillon. 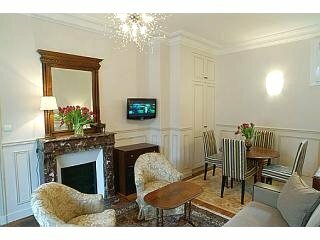 A beautiful room with a terrace overlooking the pool. Had a great swim by ourselves as it was now 5pm, cooling off and the water was not heated. Very peaceful once we braved the water. 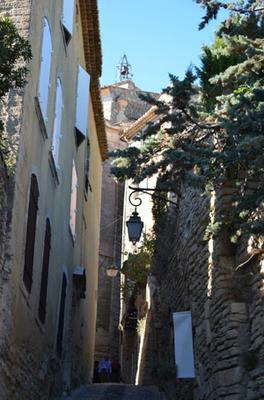 Drove the very short distance into the medieval village of Roussillon. Roussillon is red, the buildings and the cliffs. At the end of day hardly anyone there. Nice walk around town and into the small church. Our hotel had booked us a table at the fanciest place in town. We weren’t in the mood so we cancelled and tried one of the cafes on the street. I should say lane because that’s how wide they were. Chose a restaurant with outdoor tables and a nice view of the valley. Sat and sat and the waiter did not take our order. Now very smart from our Collioure France experience we got up and left. We figured that he didn’t take our order because he was pacing the kitchen. Probably only one cook in the off season. Plus, is was getting cold outside and the mistral was blowing. Walked next door to a café/bar. Sat inside where it was warm and lively with people. How smart we have become! Had a good dinner. Best steak I ever ate in France. And some profiteroles for dessert.